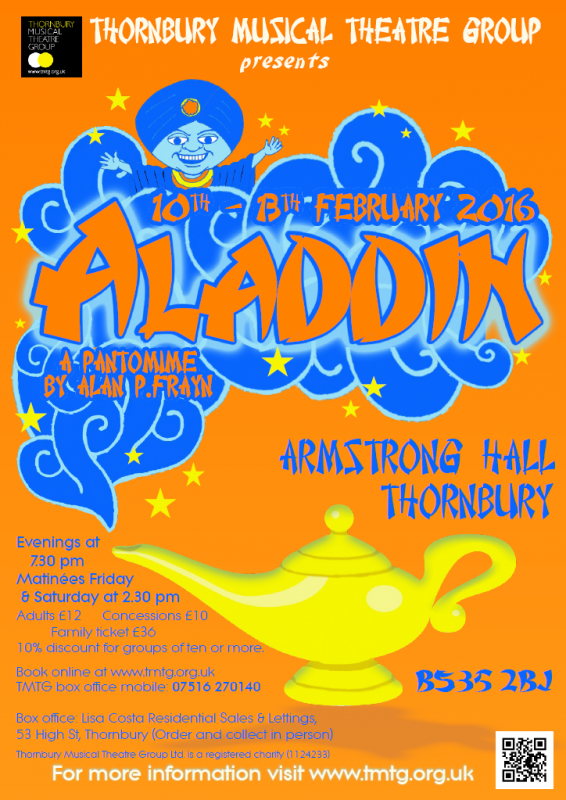 We are very excited to announce our pantomime for 2016 will be Aladdin directed by our very own Emily Costa. This very original and funny production provides all the necessary ingredients for a first-class and spectacular pantomime of this famous Oriental rags to riches tale. Bursting with comedy and visual business, courtesy of Widow Twankey, Wishee Washee and the two Chinese Policemen (Yu-Dun-Wong and Hu-Dun-Pong), this sensational production provides ample opportunity for audience participation, slapstick and traditional pantomime fun. If you're ready to embark upon an unforgettable journey into the Land of the Magic Lamp, let this "in-genie-ous" pantomime make your wish come true! Join Aladdin as he falls in love with the beautiful Princess, seeks out his fortune and returns to claim her hand in marriage. Along the way, Aladdin will shirk from his duties in the laundry, hide from a dodgy pair of policemen, overcome the trickery of a deceitful "Uncle" and benefit from the powers of the genie of the lamp. When all seems lost, along comes the good Spirit to right all wrongs, ensuring a happy ending. We featured on MADE in Bristol Television's show "The Source" at 6.30pm and 9.30pm on Monday with information about our pantomime Aladdin. Catch up now here. Who just heard us on national radio?! Our Aladdin, played by Lizzie Lindsell, was featured on today's Elaine Paige on Sunday show, BBC Radio 2 with a 'break a leg' message promoting the show! You can either listen to online by rewinding back through the show to about 48 minutes, or listen later today on iplayer. Today, two of our brave members completed their Aladdin challenges for charity! Mark Collins had his CHEST WAXED for his role as the Genie in aid of the Jessie May Trust, whilst Dave Walker, playing Wishee Washee, had his hair BLEACHED & DYED ORANGE for the Alzheimer's Society. They have both done fantastically well so far with the amounts raised, but donations are still open, so please please donate if you can. Want to see them in all their glory? Book your tickets for Aladdin, which runs from Wednesday to Saturday this coming week! Aladdin badges have arrived...who's going to get one next week? Available to buy in the foyer at every performance. With exactly ONE WEEK until opening night, it's time to unveil our official Aladdin trailer! Please watch, share and of course buy tickets for for the show (at Lisa Costa's Residential Sales & Lettings or on the tickets page). Read more about One Week Until Opening Night! Time flies and our production of Aladdin is NEXT WEEK! Still not decided if you're coming? Princess Manderin and her handmaiden So-Shy are here to book your tickets and come to visit us next week! Widow Twankey introduces her family! Check out Widow Twankey introducing her family, Aladdin and Wishee-Washee. Read more about Widow Twankey introduces her family! Two of our lovely cast members are doing some fundraising alongside their parts in Aladdin. Mark Collins, for his role as the Genie, is doing a charity chest waxing for the Jessie May Trust and Dave Walker is having his hair bleached and dyed 'orange' in preparation for his role as Wishee Washee, fundraising for Alzheimer's Society. A huge well done to all that auditioned. It was a very difficult decision as all participants did so well. We are starting rehearsals for all chorus members on Wednesday (11/11). If you're interested in taking part please have a look at the Join Us page. Its that time of year again, while everyone in TMTG is frantically putting the final touches to Calamity Jane which opens tomorrow (get your tickets now! ), we have already started work on the 2016 pantomime. We will be holding a readthrough of the script on 4th November 7.30pm and auditions on the 9th November 7.30pm at Tytherington Village Hall. We took our two granddaughters to see your production of Aladdin. They were enthralled and fully engaged. We were extremely impressed by the professionalism of the production. Time flew as every moment was truly fantastic. A Joy to behold, a delight in every way. A huge well done to a brilliant cast. It was a great performance and my hubby and I really enjoyed ourselves. Everyone in the cast was amazing (the children were sooooo cute) and everyone was in fine voice, Wishee Washee and Widow Twankey were my favourite characters. Well done on a fab performance. What an excellent Panto! We all enjoyed Aladdin very much. Great entertainment as usual from your group. Read more about Excellent Panto! We really enjoyed ourselves last night. Thank you. The show was excellent with some splendid dancing and the whole thing was very polished. I think this Panto was the best one so far (although I’ve only been to two in my life). There was good entertainment and the cover-ups on forgetting lines was a talent on its own!! 10/10 performance from the “Wishy Washy” and “Abernaaza” and all the crew. Keep up the good work!!!! Haven’t been to a panto in years and Aladdin was brilliant. My god daughter was so excited that she was allowed to come on stage - she and her mum thoroughly enjoyed it too. A great afternoon out for the kids. Great songs, especially the a cappella version of Flashlight at the end…loved it! Read more about Loved It! Brilliant show, thanks for the shout out. Youngest kids loved going on stage. Older kids thought music was great, Jess J, Ferell and One Direction, Pantos are "cool". A great afternoon seeing all having so much fun. Please pass on my thanks to all involved.